Legendary entertainer Bette Midler is auctioning off a large chunk of her fabulous wardrobe next month, reports People. Over 300 items, including dozens of gowns and costumes, will be up on the auction block. And no need to feel guilty if you bid - proceeds benefit the New York Restoration Project. Julien’s Auctions in Beverly Hills will host the sale on November 12, but the public can preview Bette’s collection (for free) at the auction house beginning October 31. If you have deep pockets, you can purchase a piece from The Divine Miss M’s personal collection – more famous costumes and album cover outfits are generally estimated at a few thousand bucks each. But bargain shoppers take note! There are many ensembles that are estimated in the $500-$800 range. For instance, a tour performance jumpsuit, or a Valentino evening gown. 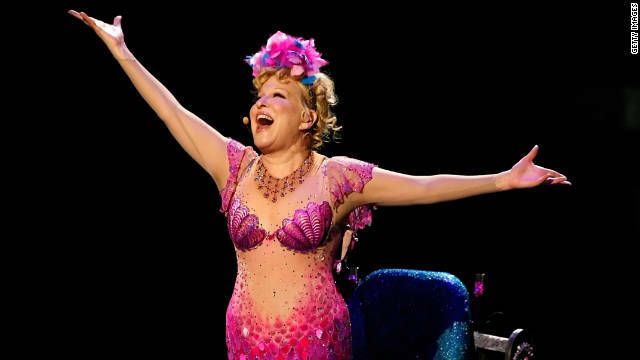 Maybe wheelchair mermaid Lady Gaga will score the real deal – Midler’s original wheelchair mermaid ensemble. Other iconic outfits up for grabs include a black-and-white Valentino number Bette wore to celebrate the designer at a 1992 event, and a pink feathered showgirl costume from her Vegas performances. Bob Mackie stage costumes, vintage Emilio Pucci, album cover outfits, jewelry, art, sketches, props, gold records and plenty more will be included in the auction, which is expected to fetch a pretty penny for Midler’s pet project. The 65-year-old singer/actress/comedian started the New York Restoration Project in 1995 to clean up public spaces and parks in New York City. « Previous entry'Real World': Occupy Wall Street? You could also use the dresses as bed sheets, or a tent at an occupy Wall Street protest. Wow..What a classless hating bunch on this internet board! She does have a fan base which will buy her items. I think is very talented, funny and has wonderful voice. Sorry some of you got a bad experience. And you wonder why some people hate Americans. Anyone who is size "fat" should be very excited. Anyone would be lucky to have a little piece of this iconic woman. We love you Bette Midler for all the great things you do esp for NYC. I dont hv to make sense. im just here 2 cuze trouble cuze i feel like it. I love the Printapons website. It is so convenient and easy to use. It's coupons are great and there are sooo many. 5 stars all the way. U don't make sense mr ed. I thought u were kool. Not any more. don't want her stuff? don't buy it. it's being sold for charity to clean up NY. chill out! Hold on Scotty, I think I heard this planet has drag queens and something called Walmarts with pizza. This needs further investigation. Beam me up Scotty, too many boring trolls on this planet. U give out pop corn balls and dress up ? U are a real nice person. Where do u live. I want to trick or treat at ur house ! @Peace..i'll fly in from NJ on hallow's night. I don't care for kids. They talk too much and make too much noise. Can we cook them up and feed them to the trolls? @ Louise, I also like her costume from HocusPocus. I would love to have it for Halloween pm to pass out popcorn balls. (I dress like wicked witch every year for my lil' ghosts & goblins!) @ guest19, That movie is a tear jerker, but, good! I think the auction will do well. Still listen to her songs The Rose and also Wind beneath my wings. Confident the auction will fetch a large sum for her beloved project. Loved her in the movie "Beaches". To all the haters: SHUT THE HELL UP!!! Ms. Midler is very talented actress and terrific singer. "Do You Want To Dance" is one of her best songs. I just love it!! So just shut the F*** UP!!! Did you hear? Lindsay Lohan was taken into custody again today for a parole violation. Someone posted a 100,000 dollar bond for the starlet. She failed to meet her obligation of helping out in a womens shelter. The judge said they wanted to jail Ms Lohan for her repeated probation violations but it would do no good. Due to jail overcrowding the judge was sure the county sheriff would just release her. As punishment, Lohan was taken into custody until a 100,000 bond could be met. She was also ordered to serve community service time at a local morgue. I saw her live on Broadway several years back. She is a gigantor. A giiiiiiiiant hippopotamus. Her horrendous singing almost left the audience sick to their stomach. I loved her witch costume in Hocus Pocus. She is a tiny woman. Gaga should look into this. She sure has a screachy hollerring singing voice. When I am doing important scientific experiments in the laboratory if she comes on the radio I have to turn it off. The howler monkeys all think she is wanting to mate with them and stuff. Plus I be her clothes wouldnt fit. She is such a big fat thing and all. Ok...that is just mean spirited. Have some class and hold your tongue. She a beautiful, talented, funny woman. I dont want any of her old used stuff. I can get brand new stuff cheaper at Walmart. Plus some of the Walmarts even have a pizza place there.